Jorge Lorenzo showed his class to end FP3 almost 0.5s ahead of Marc Marquez, as Redding, Smith and Crutchlow make it through to Q2. Warmer conditions (Track temp. 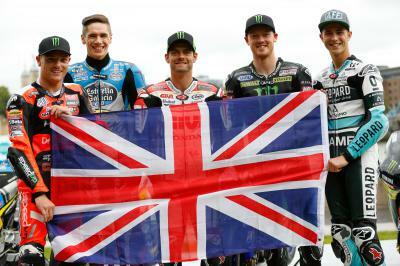 25˚C) at Silverstone on Saturday saw riders immediately go faster than they had on Friday as they attempted to secure their place in Q2. Movistar Yamaha’s Jorge Lorenzo left it late to set a 2’01.429 to end the session 0.459s ahead of Repsol Honda’s Marc Marquez. 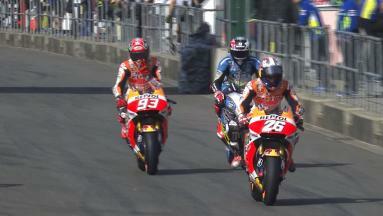 Marquez had led for most of the session after setting his fastest time of the weekend on just his second lap. 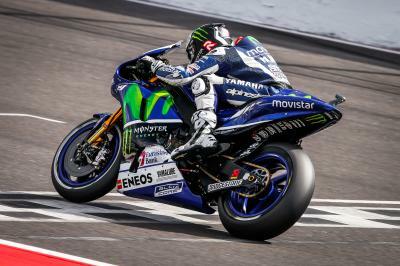 The Spaniard though had no answer to Lorenzo’s pace on fresh rubber at the end. Ducati Team’s Andrea Dovizioso (+0.540s) was third fastest as he made use of the extra soft tyre available to him at the end of the session to ensure his place in Q2. Marquez’s teammate Dani Pedrosa (+0.591s) managed to secure fourth as he improved on his time from Friday by over half a second. Scott Redding (+0.690s) on the EG 0,0 Marc VDS Factory spec Honda put on a show for the home fans to finish as the leading British and Satellite rider in fifth. 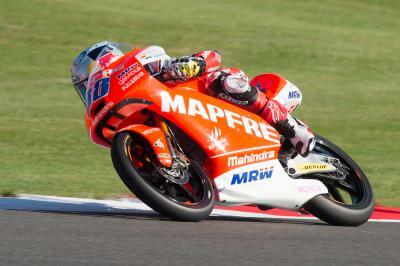 Redding has won twice at Silverstone before in 125cc and Moto2™ and he managed to automatically secure his place in Q2 for just the second time this season. Monster Yamaha Tech 3’s Bradley Smith (+0.696s) was just 0.006s behind his compatriot in sixth, as he continued the form that saw him end Friday’s practice in third. Valentino Rossi (Movistar Yamaha) improved his time from Friday by over a second to finish in seventh as he swapped for a fresh medium tyre at the end of the session to record his flying lap. 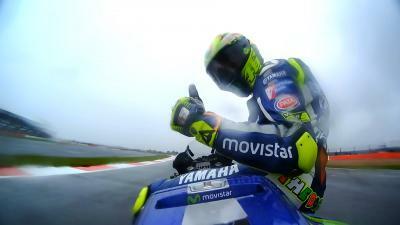 Rossi, who is tied with Lorenzo at the top of the standings on 211 points, finished 0.774s behind his teammate. LCR Honda’s Cal Crutchlow made it three British riders safely through to Q2 as he secured eighth, ahead of Pol Espargaro (Monster Yamaha Tech 3) and Andrea Iannone (Ducati Team). 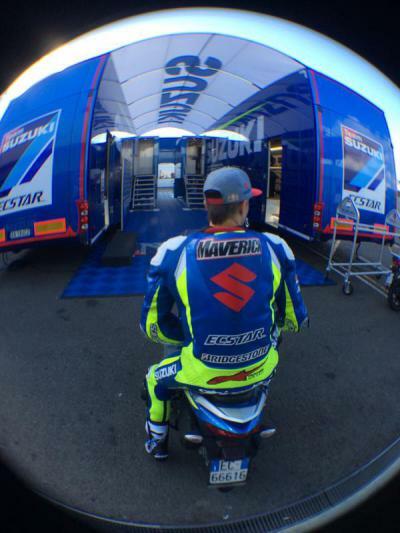 Both the Team Suzuki Ecstar GSX-RR’s of Aleix Espargaro and Maverick Viñales will be forced into Q1 after finishing in 11th and 12th respectively. Espargaro crashed at turn 12 about halfway through the session, but was unhurt. Eugene Laverty (Aspar MotoGP Team) was the leading Open class rider in 15th, with Australian Jack Miller (LCR Honda) in 19th and Nicky Hayden (Aspar MotoGP Team) 20th. Check out the combined MotoGP™ Free Practice results, FP4 kicks off at 13:30 local time. 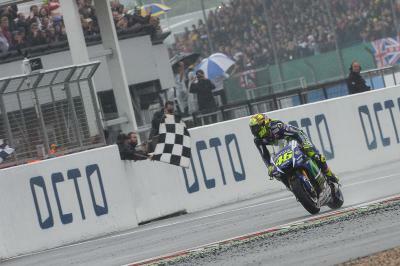 Rossi wins in the wet, Petrucci claims his first ever MotoGP™ podium, and Redding rocks the Octo British Grand Prix. Jorge Martin put his Mahindra on top of the pile in Saturday's Free Practice 3 ahead of Karel Hanika and Jorge Navarro. 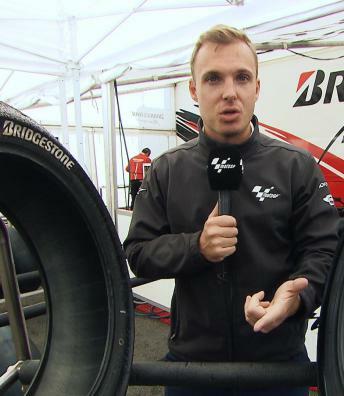 Britain have not had a World Champion since Barry Sheene in 1977, but home fans have a lot to cheer about in 2015. 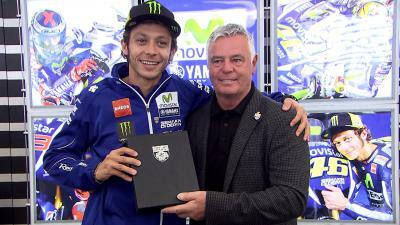 Valentino Rossi is the first ever motorcycle racer to become an honourary member of the British Race Drivers' Club. 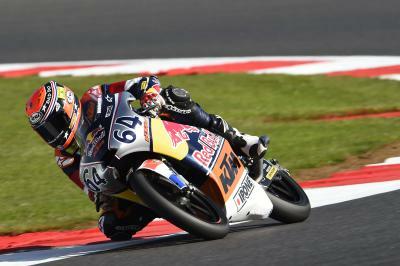 Bo Bendsneyder signalled his intent to extend his Red Bull MotoGP Rookies Cup points lead by taking pole position ahead of Marc Garcia. Repsol Honda’s Marc Marquez ended Friday just 0.033s behind Lorenzo on the combined timesheets. 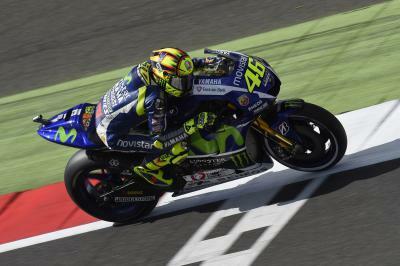 Valentino Rossi struggled on the opening day of practice at the Octo British Grand Prix, finishing down in tenth overall. Danny Kent had a tricky start to the British GP after a technical issue forced him to miss FP1, recovering to finish in sixth overall. 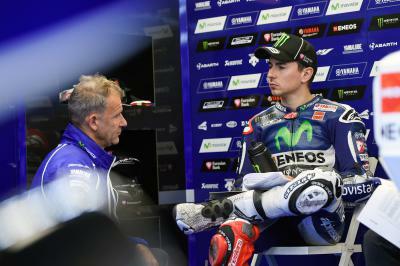 Jorge Lorenzo made the best possible start to the Octo British Gran Prix, topping Friday practice.